The history of Buddhism in Tibet has been turbulent, going through periods of revival and decline. Lama Tsongkhapa (1357-1419) was a Buddhist scholar and saint who lived in Tibet during a time when Buddhist teachings had degenerated. Through deep study, profound practice and high attainments, Lama Tsongkhapa led a renaissance of pure Buddhist teachings by emphasizing study, morality and distilling the best teachings from the existing schools of Buddhism in Tibet and from Indian Buddhist masters. His teachings became the basis for the establishment of the Gelug monastery, a monastic institution which survives to this day although it has since relocated to South India. Revered as an emanation of the three great Bodhisattvas; Avalokiteshvara, Manjushri and Vajraprani, Lama Tsongkhapa embodied the respective profound qualities of enlightened compassion, wisdom and spiritual power of all three Beings. 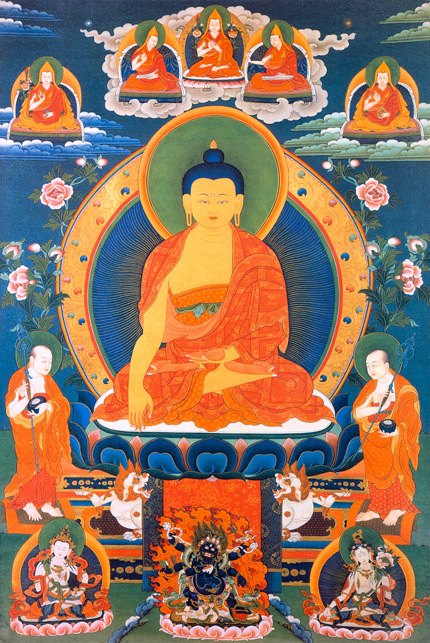 Among the many renowned teachings he gave and dharma texts he composed, Lama Tsongkhapa’s Lamrim Chenmo, translated as The Graded Stages of the Path to Enlightenment, is considered one of his greatest works and is widely studied today, by both ordained Sangha and laypeople all over the world. 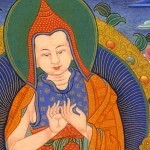 Despite his high attainments and enlightened qualities, Lama Tsongkhapa never exhibited any public display of miraculous powers, such as clairvoyance, and expressly prohibited his disciples from doing so. Instead, Lama Tsongkhapa focused on studying and teaching pure Buddhadharma, and was a role model of pure virtue. The Gelug school of Buddhism, which means “Virtuous” tradition, arose out of his teachings, and has become one of the fastest growing Buddhist schools on the world today. Countless eons ago, during the time of the Buddha Peak-of-Power, the being who was the same mind-stream as the future Lama Tsongkhapa was the main disciple of the Buddha of wisdom, Manjushri, and became known as the Bodhisattva Strength-of-Mind. The Buddha Peak-of-Power predicted that the Bodhisattva Strength-of-Mind would manifest in the future as an enlightened Buddha known as Tathagata-Lion’s Roaring or Tathagatha Simhananda. During the time of the Lord Buddha Shakyamuni, the Bodhisattva Strength-of-Mind had incarnated as the son of a Brahmin, the highest of the social classes in Indian society. On meeting Lord Buddha, the young boy was moved and immediately made an aspiration to free all beings from the sufferings of samsara. The young boy went up to Lord Buddha, prostrated and offered a clear crystal mala, or rosary, up to the Buddha. When Lord Buddha received the mala, he placed his holy golden hands on that boy’s head and predicted to his disciple Ananda that 1,500 years in the future, approximately, in the land to the North, of the red-faced barbarians, this young boy who offered this rosary will revitalize the teachings of the Buddha when it has become degenerated. Lord Buddha also prophesized that the boy’s future incarnation would be an emanation of Manjushri and he would be called Sumati Kirti, also known as Losang Drakpa, and he would establish a monastery called “Ge“, which meant “Virtues“, between the areas of Dri and Den,and that he would also offer a crown to a Buddha statue in Lhasa. He would also bring all the correct lineages and correct teachings together, he would study, contemplate and meditate. He would gain the results, pass the teachings to many and make the teachings very strong and very powerful in the Land of the Snows, Tibet. After Lord Buddha made that prediction, Lord Buddha summoned one of his disciples, Mahamaudgalyayana, who was a highly attained Arhat. Mahamaudgalyayana had the power of speed, which was the ability to walk very fast over vast distances. Lord Buddha gave a conch shell to his disciple and directed him to bury the conch shell in a certain place. This conch shell was none other than the precious shell which had been presented to Lord Buddha by the Naga King, Anavatapta, and had been used to announce the teaching of the Buddha. A conch shell symbolizes the spreading of the Dharma, and when it is blown, a deep pervading sound reverberates and touches all who hear it. 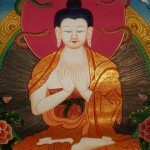 A conch shell also represents the speech of a Buddha, so Lord Buddha was indicating that the young boy would be instrumental in the spread of the Doctrine and that he would do great work to spread Dharma in the future. Mahamaudgalyayana walked immediately to Tibet, to a place just a little distance from Lhasa and buried the conch shell under an area that is shaped like a conch shell. In 1409, when Lama Tsongkhapa started building Gaden Monastery, this very same conch shell was unearthed which fulfilled Lord Buddha Shakyamuni’s prophecy. 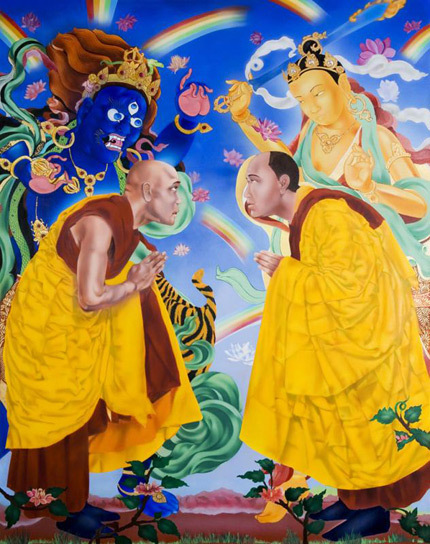 It was later moved to Drepung Monastery where it could be seen until 1959. A thousand years after Buddha Shakyamuni’s prophecy, another prophecy of Tsongkhapa came by way of the Lotus Born Guru Rinpoche, Padmasambhava, who had arrived in Tibet during the 8th century and aided in the establishment of Buddhism as the state religion. 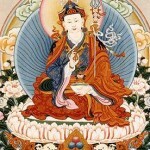 Renowned for his mystical divinational abilities and subjugation of evil spirits and demons, Padmasambhava foretold that a fully ordained Buddhist monk named Lobsang Drakpa would appear in the east, near the land of China who would be regarded as an emanation of a Bodhisattva of the greatest renown and would attain the Complete Enjoyment Body of Buddha – Enlightenment. 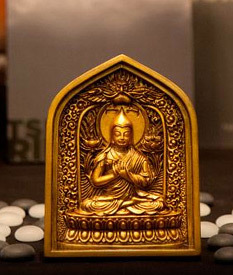 Lama Tsongkhapa has emanated in many holy forms throughout time. According to the second Dalai Lama, Gedun Gyatso (1476-1542), Lama Tsongkhapa, the Eight Century Nyingma Master Padmasambhava and Atisha (980-1054) are one and the same Being. Lama Tsongkhapa is also said to be an incarnation of Nagarjuna. It would be difficult to list all previous lives of Lama Tsongkhapa, but below are some of prominent incarnations. Nagarjuna – Nagarjuna was the Great Pioneer of the Middle Way who appeared in South India, four hundred years after the Nirvana of Buddha Shakyamuni. Lama Tsongkhapa was also Dombi Heruka. This great Siddha was the king of the Indian Kingdom of Magadha in the Ganges plain. Practicing Tantras while still on his throne he achieved great realizations. But because of his unconventional behaviour and more particularly because he had taken an outcaste class woman as his consort, his subjects made him leave his royal position. The king went to the forest with his queen. But later realizing his value, the people requested him to come back. He and his consort rode out of the forest on the back of a pregnant tiger. As a condition for his return, the king requested that he and his consort be put to the purification through fire, from which they both emerged inside a lotus bud. Padmasambhava – Later on, thus attesting his particular link with Tibet, Lama Tsongkhapa was Padmasambhava, the great Indian Master that played such a fundamental role in the first spread of the Teaching of the Buddha in the Land of the Snow. Following the advice of the Indian Master Shantaraksita who had already come to Tibet but did not succeed in thoroughly spreading Buddhism, the Dharma king Trisong De-u Tsen (755-797) had invited this pre-eminent tantric master to Tibet. Padmasambhava remained there for several years, taming the demons and tirelessly giving teachings on the Tantras. 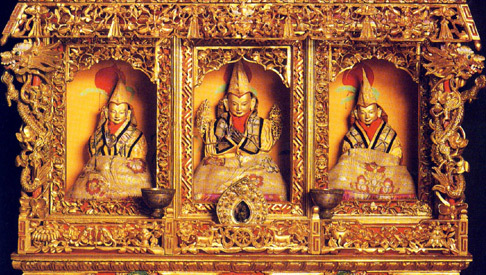 He notably erected Samye, the first Tibetan monastery that was built as a vast mandala. 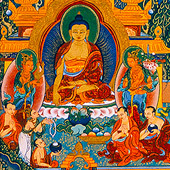 Atisha Dipamkara Srijnana – Lama Tsongkhapa was also Atisha Dipamkara Srijnana (982-1054), one of the foremost Buddhist Masters in India during the first half of the eleventh century. Coming from a noble family of Bengal, he studied and practiced at the feet of the most celebrated teachers of this period and resided for long in the prestigious Buddhist university of Nalanda. In 1042, he was invited by the Tibetan king of Western Tibet to assist the renewal of Buddhism in this country. He taught without weariness and composed A Lamp for the Path to Awakening (Bodhipathapradipa) one of the most influential Indian text received by Tibetans. 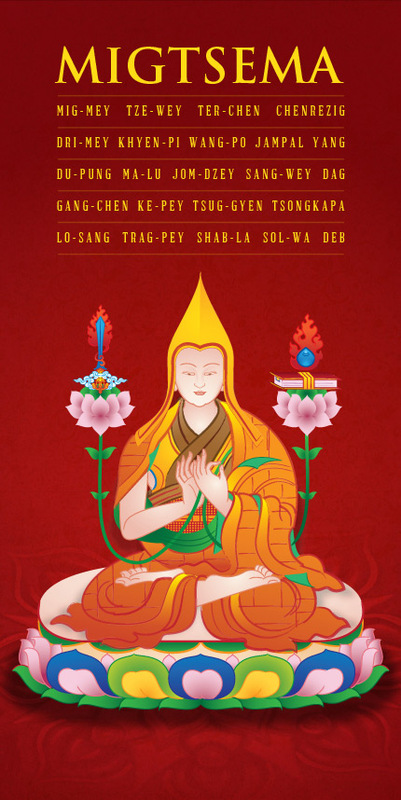 Tsongkhapa was born on the 25th day of the tenth month in the year 1357 CE in the Tsongkha, a region of Amdo, presently integrated in the Chinese province of Qinghai, an area bordering Tibet and China, There were many auspicious signs around his birth. From the time of his conception in his mother’s womb, his mother had continuous dreams and signs. A mother having dreams and signs before giving birth to someone special is not anything special to the Tibetan tradition. It is a phenomenon that can be seen in all traditions, all around the world, in all religions and for all people. When these mothers are about to bear someone special in their body, someone who will have a highly beneficial impact on many beings, they will receive many great signs before and during pregnancy. Dara Katche Lubum-gue, – Tsongkhapa’s father, was from the tribe of Mel. He is described as a good man, brave and intrepid. He had great faith in the Three Jewels and his veneration for the Dharma Masters was deep. Dara Katche was also known for his regularly recitation of the prayer of the Praises of the Names of Manjushri (Manjushri nama samgiti). Shin-mo A-chös – Tsongkhapa’s mother, was full of kindness and spoke frankly. She had respect for every one and showed a particularly great benevolence for those who were exhausted or unprotected. Having always in mind the six syllables mantra of Avalokiteshvara “Om Mani Padme Hum,” she was vigilant in solely performing virtuous deeds. Dara Katche Lubum-gue and Shin-mo A-chös had six children. Lama Tsongkhapa was the fourth. The biographies of Lama Tsongkhapa reveal that there were many, many great signs heralding his birth. For example, his mother dreamt that Lord Vajrapani threw vajras from the heavens, which landed softly and gently on her womb. She had frequent dreams of Lord Manjushri appearing and casting his sword towards the direction of her womb and stomach. who was princely and wore six ornaments; he came forth in her dream, washed her body with pure crystal water, dressed and adorned her up and told her, “Someone special is coming to you.” Just before she gave birth, she dreamt that many monks came to make offerings and were looking for the Buddha. They asked where the Buddha’s shrine was. A young boy appeared and pointed to Tsongkhapa’s mother’s womb. The young boy had a key which opened up a box in her womb and within was Chenrezig. On the evening of the 10th day of the first lunar month of the fire bird year (1357), Shin-mo A-chös, the mother of Lama Tsongkhapa, dreamt of a vast number of monks and laics. Men and women, holding victory banners and beating drums, were moving forward toward Shin-mo A-Chös. They explained they came to welcome Avalokiteshvara. 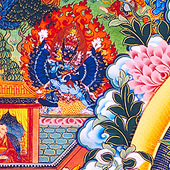 These were very powerful portents of the Lord of Power, Vajrapani, the Lord of Compassion, Chenrezig (or Avalokiteshvara), and the Lord of Wisdom, Manjushri. They showed many signs that it was not just one holy being or an emanation of a holy being that would be entering Lama Tsongkhapa’s mother’s womb, but the actual three Bodhisattvas themselves. When Lama Tsongkhapa was born, his mother suffered no pain. Many dakinis and dakas – celestial beings likened to angels – were heard singing outside with incredible voices. Rainbows appeared. After Tsongkhapa’s birth, his placenta was buried in the ground. From that exact spot, a very large and splendid sandalwood tree sprung up with more than hundred thousand leaves featuring images of the Buddha Simhananda and the mantras of Manjushri. Every autumn, when the leaves fell onto the ground, pilgrims would reverently collect and keep them. When those leaves were crushed and made into medicine, people who ate it would become healed. That tree became known as the Tree of Kumbum, with Kumbum meaning “a hundred thousand Buddha images” and is preserved until today. Later, Kumbum Monastery was built on that sacred spot and has been visited by several of the Dalai Lamas throughout history. It remains a highly revered pilgrimage site today. The day after Lama Tsongkhapa was born, the Kadampa Master Choje Dondrup Rinchen Rinpoche (1309-1385) sent some gifts to Tsongkhapa and his family, with explanations on how to protect the baby. 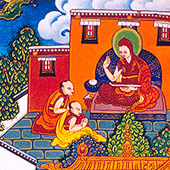 When asked by Tsongkhapa’s father at a later date how he knew of Tsongkhapa’s birth, Dondrup Rinchen said that he had dreamt of Yamantaka a while before the birth of Tsongkhapa and when Dondrup Rinchen requested for blessings from Yamantaka, Yamantaka indicated that he would come to the area of Tsong Kha in a year’s time. Having noted that he was an extraordinary child, Lama Tsongkhapa’s father sent him to receive layman ordination when he was only three years old from H.H. the Fourth Karmapa, Rolpay Dorje (1340-1383). Tsongkhapa then received the name Kunga Nyingpo. This illustrious Master, Rolpay Dorje, predicted that his boy would be referred to as the Second Buddha. At the age of seven, Lama Tsongkhapa received his novice ordination vows from Dondrup Rinchen, who was to become Tsongkhapa’s first teacher, and from whom he received the ordination name Losang Drakpa. Lama Tsongkhapa’s parents recognized their son’s superior qualities and when Dondrup Rinchen requested his father to entrust his son to him, Tsongkhapa’s father agreed. 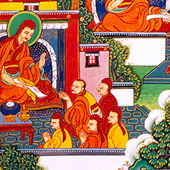 Without being taught, Tsongkhapa could read and write Buddhist texts, just by observing his teacher. Even at this young age he had received many teachings and initiations of Heruka, Yamantaka and Hevajra, and could recite texts like Expression of the Names of Manjushri from memory. 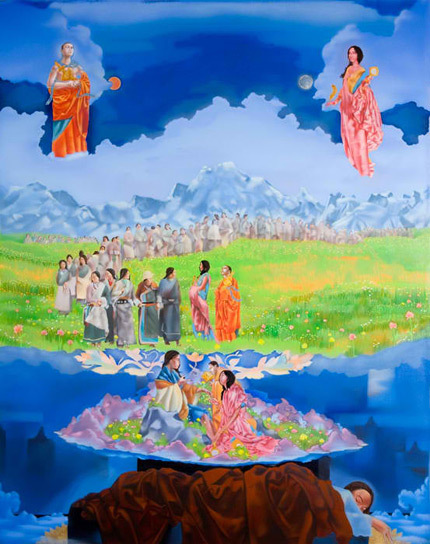 Tsongkhapa also had frequent dreams of Atisha, which indicated that he would follow Atisha’s footsteps in restoring the purity of the Dharma and excel in the practices of Sutra and Tantra. As a child, his recitation of Manjushri’s mantra was said to be so strong and powerful that the letters of his mantra magically appeared on the walls of his room as if the characters had been carved there. Lama Tsongkhapa stayed with Dhondrup Rinchen until he went to U-tsang for further study at the age of sixteen. in 1373, Lama Tsongkhapa left his teacher Dhondrup Rinchen to start his extraordinary journey in search of Dharma. As a parting offering to his Guru, Tsongkhapa made a mandala offering to Dhondrup Rinchen, which looked like sparkling jewels. Tsongkhapa then recited the Praises of the names of Manjushri to his Guru as he walked away from him. He had a strong feeling then that he would never come back to his hometown again. Dhondrup Rinchen advised him to focus on Yamantaka, Vajrapani, Manjushri and Amitayus and to propitiate three Dharma Protector; Vaisravana, Mahakala and Dharmaraja to ensure conducive conditions for his practice. At first, the young Tsongkhapa followed his teacher’s instructions diligently and practised regularly but at a certain point in time, he stopped practising. He later explained to his disciples that the physical illness he suffered and difficulties he encountered during certain studies thereafter were the result of his neglect of his Guru’s advice. In the autumn of 1373, he travelled to central Tibet, to Drikung Kagyu Monastery where he trained with Chennga Chokyi Galpo and studied the five sections of the “Great Seal” (Mahamudra) and Bodhicitta. From there, he travelled on to Nyetang, one of the largest monasteries of the day and was tutored by Tashi Sengi and Densapa Gekong. These are only a few examples of the extensive study he did with very prominent teachers of the time. Tsongkhapa’s ability to memorize and comprehend great texts was astounding. Through the course of his study, he gained great respect from both his teachers and fellow students for his vast abilities to absorb and expound some of the most profound teachings. From 1373-1393, Tsongkhapa would travel all over Tibet, studying under 45 of the greatest teachers from different Buddhist lineages. He mastered not just the Buddhist teachings of Sutra and Tantra and engaged in countless deep retreats, but also excelled in medicine, astrology and poetry. Lama Tsongkhapa had studied extensively with the Sakya teacher, Nyapon Kungpa Pel. However, as Tsongkhapa came to request for teachings from him one day, Nyapon Kungpa Pel was struck by an illness and unable to teach. He referred Tsongkhapa instead to his chief disciple, Jetsun Rendawa. The Sakya Master, Rendawa, and Lama Tsongkhapa’s Guru-student relationship became legendary and they were very close. In Tsongkhapa’s search for Dharma, Rendawa was also impressed by his young student’s immediate grasp and in depth understand of the teachings, and Rendawa never had to repeat himself. Lama Tsongkhapa studied intensely and continuously; not just the main scriptural texts but also the commentaries, His capacity to memorize was phenomenal and his skill at debate legendary. His attainments were reflected in the fact that despite the reverence and respect gained from the spiritual community and renowned teachers, Tsongkhapa never had the slightest sense of arrogance or pride. In honour of his Guru, Lama Tsongkhapa offered a prayer to Rendawa. Tsongkhapa had earlier received a prayer from Manjushri and so, he altered two lines to suit his Guru and offered it to him. However, Rendawa then altered the verse to include Tsongkhapa’s name instead and offered the prayer back to Tsongkhapa. This prayer, containing the blessings of both Lama Tsongkhapa and Master Rendawa, is now known as the Migtsema mantra, one of the most important prayers for Gelugpa practitioners and devotees of Tsongkhapa. It is the heart of Lama Tsongkhapa’s Guru Yoga, which was composed by Pelden Sangpo. Grant protection to me; a fly seeking liberation. Losang Drakpa, at your feet, I pray. At the age of 23, Tsongkhapa went to the region of U to meet up with some people from his hometown, Amdo. His friends entreated him to return to Amdo and they also gave him a letter from his mother. She also requested him to return to Amdo and had slipped one of her white hairs in the letter too. Touched by this, Tsongkhapa considered returning to Amdo for a while. However, when he contemplated deeper. he realized that if he left for Amdo, he would be disrupting his practices of mental discipline. As there was no benefit, he sadly decided not to return to his homeland. Instead he sent a thangka of a painting of himself to his mother in Amdo. When his mother opened it, the picture spoke to her and it was as if Tsongkhapa was there with her, which brought her great joy. In a letter accompanying the thangka, Tsongkhapa requested his mother and sister to build a stupa around the sandalwood tree which had sprung up at his birth. 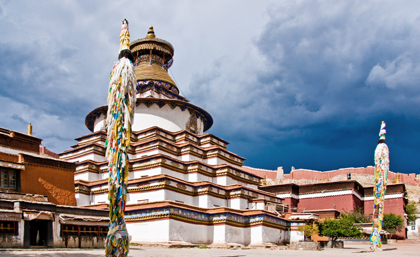 His mother and sister complied and from that stupa, the holy monastery of Kumbum developed. 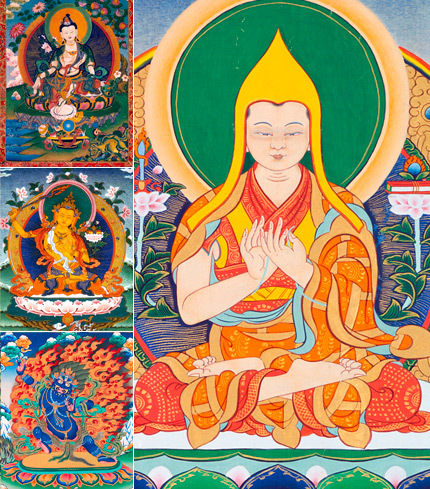 In his twenties, Lama Tsongkhapa was already gaining great renown for his sharp comprehension and skilled speech. The number of his disciple was growing and Tsongkhapa decided that it was time to become a fully ordained monk. He went to Namgyel Monastery in the region of Yarlung, where he took his ordination vows from the Sakya Master, Kashipa Tsultrim Rinchen, in the presence of 20 members of the Sangha. Tsongkhapa kept his vows strictly throughout his entire life, and always held the vows in the highest regard.